Two posts came out in the last day on online education. One is by Clay Shirky and the other is by Alex Tabarrok. Both are worth reading. Both make a similar point although in very different ways. They argue that critiques of massively online open courses (MOOCs) are misplaced because they are comparing them to a very small set of college experiences; that of the top 50 institutions. The vast majority of higher education is taught outside of this mix and, as Tabarrok notes, there is a significant amount of it delivered online to non-17-21 year old single people. That means that the institutions that are really in line to be disrupted are not in the top 50 that the smartest people go into and come out of still smart. It is the institutions that actually may have always been doing more to actually mean something for educational productivity. The best way to increase the quality of teaching is to increase the number of students taught by the best teachers. Online education leverages the power of the best teachers, allowing them to teach many more students. That all sounds sensible until we reflect upon what “best teachers” means. If I reflect, I know who the teachers who were best for me were and if I think harder I know that I disagreed for the most part with my classmates over that. And the reason why we have disagreements is that each individual student learns in different ways. This, by the way, is something those with a rosy forecast for MOOCs realise. They argue that individualisation will be possible in learning (a la the Khan Academy) but at the same time argue the best teachers can be leveraged. But let’s consider for a moment that what they mean is that by untying at least lectures from institutions, then we can get more efficient matching between lecturers and students. What we imagine here is that having some people speak to you (in broadcast form) is the right way to leverage them. And there are some powerful lecturers; just consider who we get via TED talks. But that isn’t the only way to communicate knowledge. I’ll take myself as an example. I’m a far better writer in explaining things than I am a lecturer. I am far better at designing slide presentations than I am at delivering them. But in every institution I have been a part of there is no room for flexibility. My teaching is defined literally by the number of hours I stand up and speak to students in class. When I do better at that it is because I have had the time to design slides or write great notes or textbooks. When I don’t have that time, the class is less effective. If we had a truly flexible system, I could deliver a course in a way that leveraged my teaching skills and you never know, this may actually be better for students who are otherwise forced to endure my lecturing. (Actually, hopefully I am not that bad but from my evaluations it is clear that there exists a group of students who just don’t like being there at 7am!). That, however, is surely only part of the story. Leverage can only really be achieved if one lecturer can provide material (in whatever form) that can be effective through one way interaction. 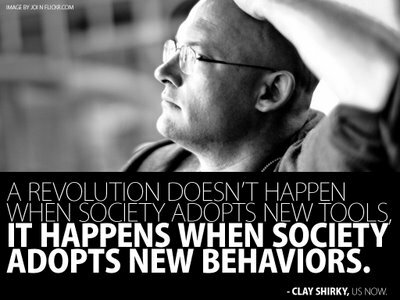 Both Shirky and Tabarrok are encouraged by opportunities for lecturers to learn. Online courses can be kept more honest because they have more eyes on them. They have opportunities through large sample size to experiment and learn what is effective. But in each case, they can only improve what is effective for a broadcast model where material is provided (including individual learning platforms delivered digitally). They cannot provide two-way or multi-way interaction because those modes require people and this will limit leverage. It is possible to continue on and think about where all that might lead but I believe that it would take me well beyond blog post attention span. The point here is that what we are seeing is a reorganisation of tasks in higher education. The question of whether that will drive a reorganisation of the institutions themselves is still somewhat open. Somehow I missed this CP Grey take that came out last week. I have attended a number of MOOC’s. It reminds me how of professors were paid in the 19th century – by the size of their audience. Alex is wrong to think that expert’s knowledge scales by having a more powerful megaphone. Nice article. Appreciate your thoughts. But okay – the reality is that most higher ed courses ARENT interactive. They remain and continue to be some academic in lover with their own voice talking AT the students and insisting that the students agree with whatever they are shoveling out. That really isnt high value education – and when the cost of education gets out of control – we are forced to reconsider the value of these educational experiences. Academics have always been curators. Traditionally they have been curators of the written word. Well now they become curators of multimedia and of lectures. The idea of every lecturer recreating the same lecture wheel has become anachronistic. And if academics can spend less time in class preparation, then they can teach more classes. Another but related thoughts. Returning to my son school, I could feel a sense of common discomfort. Then I realized. Lectures are run just like office meetings. And lectures will run class to fill the time just like meeting hosts. They are horrifically inefficient, with the majority of participants twittling pencils while the host / lecturer carriers on. In some ways this comes back to the first statement – as much as we would like to pretend that classes are interactive – most arent. Well particularly for those 100 student freshman classes, where the lecturer can act as curator of good content, why not use high quality lecture content that has already been produced by someone who takes extra time upfront to make a compelling educational experience – rather than have the average lecturer drone on for the N+1 class session and ineffectively deliver the content. The academic experience is very broken. The consumer is not getting value for their investment and the student is not getting a academically challenge. Yes, the institution needs to be torn down and rebuilt. And frankly it already is – as more and more HS students are earning college credits while in high school, or are opting to go to local school for 2 years before heading off to more expensive schools. Families simply cannot justify the investment in the old school, country club, educational experience. One of the photos says it all. I grade-school boy excitedly raising his hand to be called on by the “teacher” for approval of his having “gotten the answer.” Does an “attaboy” from a computer have the same motivational incentive? Another thing that may happen is that professors at universities will focus less on the introductory material, and leave that to MOOCs, and instead focus on very specialized areas in their field. the recent course on PGM’s on coursera being a good example. Currently PGMs are not on the curriculum in most places as they are quite exotic. but as a MOOC there is enough interest to hold a course twice a year, and people who are interested in the field can gather there and learn about it. Do you really believe that? The smartest people go to the top tier of schools? Previous PostPrevious What are publishers afraid of with device restrictions?